The following is a glossary of terms used in card games. Besides the terms listed here, there are thousands of common and uncommon slang terms. This list does not encompass terms that are specific to one game. 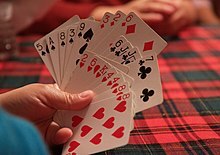 For bridge, the Glossary of contract bridge terms which covers contract bridge, duplicate bridge, and auction bridge; some of the terms are also used in whist, bid whist, and other trick-taking games. For patience (solitaire), the Glossary of patience terms. For poker, the Glossary of poker terms. Terms in this glossary (unlike those above) should apply to a wide range of card games. Order of priority for leading, betting or bidding, starting from the player next to the dealer. See eldest and youngest. A temporary partnership that lasts only for the current deal or hand (e.g. Prop and Cop in Solo Whist or the normal game in Schafkopf). A mandatory stake made before the game begins - usually by all players, sometimes by the dealer only. The phase in some card games where players may bid to lead the game, or bid on a certain hand or privilege in that hand such as naming the trump suit. The player with the highest bid wins the auction and plays his chosen game or exercises his privilege. Often used in trick-taking games. A less-skilled card game of the gambling type in which one or more punters play against a banker, who controls the game. Bid or contract to win no tricks (also misère). In card-point games, a card that is worth no points. A hand with no court cards, i.e. only pip cards. When your cards are visible to other players. an extra score added to a player's regular score for holding or winning certain cards or for achieving certain goals, such as Schneider. In point-trick games, the score used to determine the winner of a hand, based on the value of individual cards won. Not to be confused with game points. A hand with no trumps. A game in which a number of different contracts is played in succession e.g. Hearts, Barbu (card game), Quodlibet and Michigan Rummy. an agreement to play a certain type of game, to win a certain number of points or tricks in a hand, round or game. Card with a point value. One of the picture cards i.e. a King, Queen or Jack in a French deck; a King, Ober or Unter in a German deck, or a King, Queen, Cavalier and Valet in a tarot deck. Also face card or royal card. To divide the deck into two parts; usually after shuffling. Cards may also be cut to determine who deals or which suit is trumps. Verb: To distribute cards to players in accordance with the rules of the game being played. In many games, this involves taking all cards, shuffling them, and redistributing them, but in other games (such as Patience games) it simply involves turning over the Waste to act as a new Stock. The person whose turn and responsibility it is to deal the cards (even though this player may delegate the actual dealing to another). In a contract game, the highest bidder who then tries to achieve the announced contract. The opponents of the declarer(s) in games like Bridge or Skat. To remove cards from one's hand, often with the intention that such cards will no longer belong to oneself. Usually done with less desirable cards in an attempt to make room for more desirable cards, or when changing strategies for what cards one is attempting to collect. the pile of cards already rejected by players. Only two cards of the same suit in the hand. A card that is dealt face down. Also facedown. To take a card from the stock. The first player to play in the round. Called forehand in many games. This is the player to the left of the dealer in games that are played clockwise; or to the right of the dealer in those played anti-clockwise. Some family games will use eldest and youngest to refer to the players' actual ages. A face card depicts a person as opposed to pips (excluding jokers). A card placed face down on the table. Also downcard. A card positioned so that it reveals its suit and value. Also upcard. The marked value of a card, also called the pip value. Court cards are usually take to have a value of 10, the Ace 1 or 11. To withdraw or surrender the current hand or game. To play a card of the led suit. A compulsory round or deal in which all players must play and none may drop out. In point-trick games, the score assigned to the various contracts which is awarded to the winning player. Game points are accumulated (or deducted) to decide the overall winner. Not to be confused with card points. The player holding the cards, as in "Third hand bid 1♠." A player, or an action, is said to be in turn if that player is expected to act next under the rules. Jerry said "check" while he was in turn, so he's not allowed to raise. Onlooker at a card game. Additional cards dealt face down in some card games. To add cards to another player's melds or combinations. To play the first card of the trick. A set of matching cards, typically three or more, that earn a player points and/or allow him to deplete his hand. A hand dealt wrongly. Or to make a mistake while dealing cards. A suit symbol (♠, ♥, ♦, ♣) on a card. a card other than a court card. Verb: Move a card to a place on the table (either from the players hand, or from elsewhere on the table). A container into which money or chips are paid initially and during a game and from which the winnings are paid out. A 'pair royal'. A set of three cards of the same rank. Person who lays bets in a banking game q.v. The position of a card relative to others in the same suit. The order of the ranks depends on the game being played. To legally play a card of a suit other than the led suit. To play a card of a different suit from the led suit. May be legal or not, depending on the rules. To fail to follow suit when able to do so and the rules require it. Normally incurs a penalty. "Remove From Game" pile; a discard pile for cards which will not be used in subsequent rounds. The events between the eldest player's action, and the youngest player's action of the same type (i.e. bid, play), inclusive. A combination of playing cards where cards have consecutive rank values. Also called a sequence. When a player or team wins over 3/4 of the available card points in point-trick games, thus scoring a bonus. Typical of the Skat and Schafkopf families. The team scoring less than 1/4 of the points is said to be schneidered. When a player or team wins every trick of the hand, thus scoring a bonus. Common in games of the Skat and Schafkopf family. Position relative to the dealer: for example, in bridge, the dealer's left-hand opponent is said to be in second seat. Two or more cards adjacent in rank. The adjectives ascending and descending may be applied (i.e. "building in ascending sequence" means "laying cards out so that each has the next highest rank to the previous one"). A sequence need not all be of the same suit. Also called a run. Holding of only one card of a suit. winning every trick. Sometimes called a 'grand slam', with a 'little slam' being every trick bar one. Also called a 'march' (e.g. Euchre), 'mord' (e.g. Brandle and Grasobern), 'durch' or 'durchmarsch' (e.g. Skat and Schafkopf) in some games. A contract played alone against the combined efforts of all other players. Player who plays a solo. In trick-taking games, a player is 'squeezed' if he has to weaken himself in either of 2 suits, but has no way of deciding which. Cards are placed directly on top of each other, disallowing the player to see any card other than the top. In most cases, these cards are and should be kept hidden. Viewing these cards during a deal is often considered illegal, so they should be dealt face down. A pile of cards, face down, which are left over after setting up the rest of the game (i.e. dealing hands, setting up other layout areas). Layout of table cards in games like Zwicker and games of the Patience family. See Glossary of patience terms. The undealt portion of the pack. Same as stock. The Three of any suit. Also 'three-spot'. See Trick-taking game. A set of cards played by each player in turn, during the play of a hand. (Noun) A card in the suit whose trick-taking power is greater than any plain suit card. (Verb) To play a trump after a plain suit has been led. See Ruff. A card turned up at the start of a game to determine the trump suit. A card laid on the table face-up. The top card of a pile, turned face up. Having no card of a given suit. Hand of cards dealt face down on the table at the start of play that may subsequently be used by players to exchange cards. The last player to play before the eldest player's second turn. Some family games will use eldest and youngest to refer to the players' actual ages. ^ a b c d e f g h Parlett 2008, p. 642. ^ Parlett 2008, p. 591. ^ a b c d e Galt, David. Card Game Glossary at entertainment.howstuffworks.com. Retrieved 11 August 2018. ^ Golick 1998, p. 120. ^ Le Briscan at academiedesjeux.jeuxsoc.fr. Retrieved 11 Jan 2019. ^ a b c d e Golick 1998, p. 121. ^ a b Parlett 2008, p. 643. ^ Parlett 2008, p. xxv. ^ a b Parlett 2008, p. 644. ^ a b c Arnold 2011. ^ a b c d e f Parlett 2008, p. 645. ^ a b c d e Parlett 2008, p. 646. Arnold, Peter. Card Games for One. London: Chambers (2011). ISBN 978-0550-10201-0. Golick, Margie. Card Games for Smart Kids. New York: Sterling (1998). ISBN 978-0-8069-4887-4. Parlett, David. The Penguin Book of Card Games. London: Penguin (2008). ISBN 978-0-141-03787-5. This page was last edited on 8 February 2019, at 21:24 (UTC).